Certain places in the garden, more than others, have a stronger pull to my soul. This particular place holds its very own ambiance and gives that feeling of a garden within a garden. Being there I can hear the whispers of quiet urgings to be still, to listen, to pause. It's like a sanctuary in the midst of the wide open world. It's been two years (although it surely seems like yesterday) since I covered up the grass (September/October of 2009) linking several expanses of planting beds. 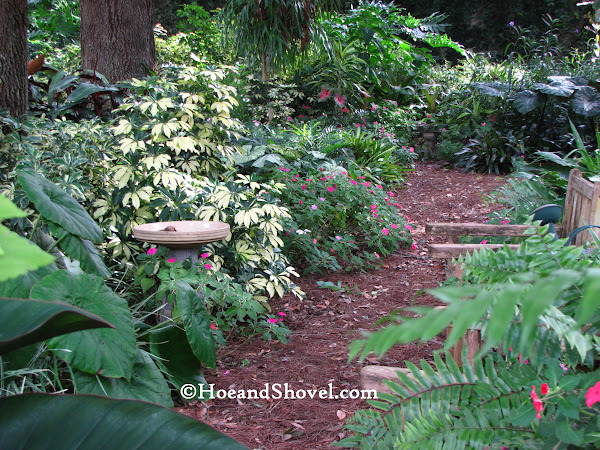 It was accomplished by layering newspapers and pine straw to create a pathway. You can go here to see the detailed "how-to" and more before and after photos. From the beginning of its creation I've been calling this area in the back gardens the 'tropical pathway'. 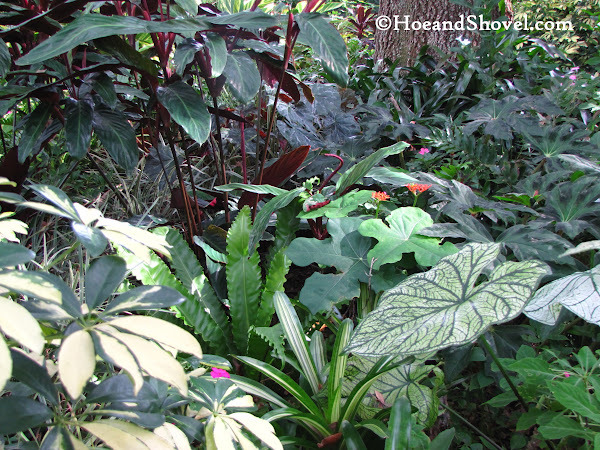 It isn't because there are exclusively tropical plants here but it is a most protective place for them. 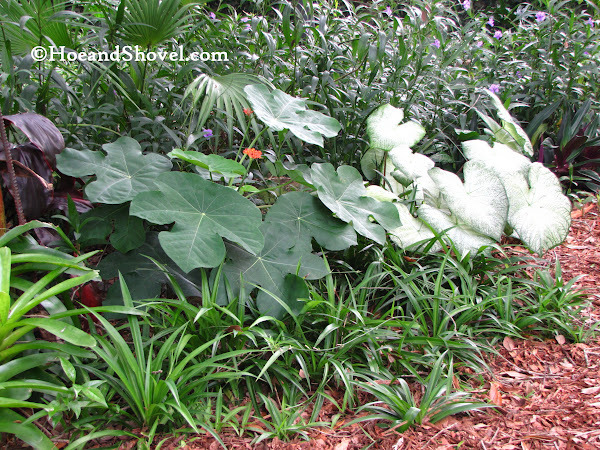 Implementing my usual philosophy of mixing up Florida-friendly plants with sturdy natives this area is a blend of many varieties that require little care. The towering, majestic oak trees have grown a dense canopy allowing just the correct amount of filtered light through as the sun rises and sets each day. 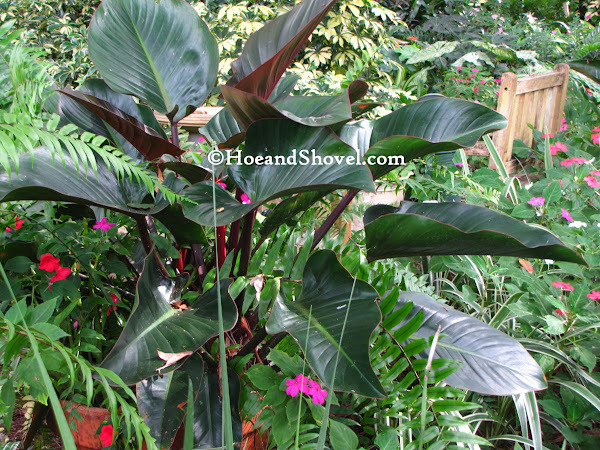 So many exotic and typically cold-sensitive plants such as bromeliads, ground orchids, begonias, bird's nest fern, stromanthe, spathiphyllum, and philodendrons are snuggly sheltered from summer's intense sunshine as well as freezing cold temps. There have been a few casualties in our record-breaking winters of late but no fatalities so far. The soil here is rich with organic natural materials such as oak leaves decomposed over many years. This contributes to the water holding power and also good drainage which most of these plant types require. With the addition of new plants ~~ either by divisions, gifts or the ones I can't pass by in the garden center~~ each season the pathway has become narrower and narrower. These plants don't mind being crowded in together with their neighbors. It is the way of the rainforest. 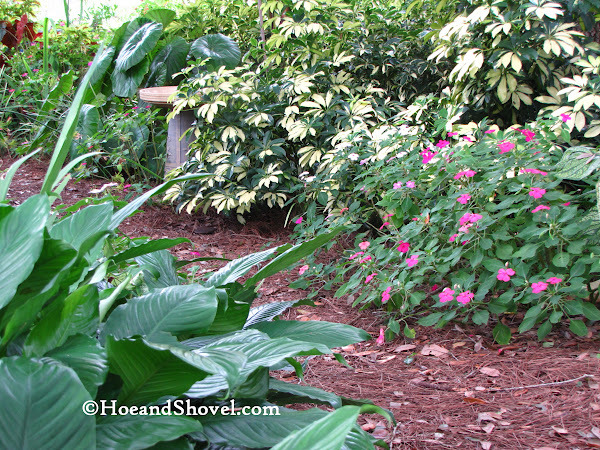 It eased the width of the passageway when I recently ripped out the volunteer impatiens that had swallowed up the seating area. (They'll be back I'm sure ~~ it's what they do around here). 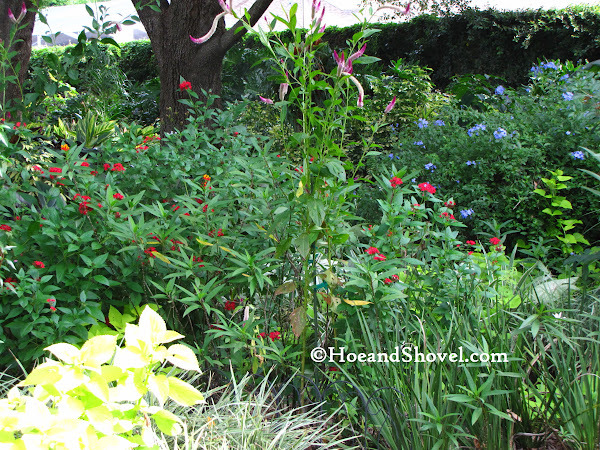 The butterfly garden that was added a year later adjoins this area. A separate pathway leads one to the property line on the south side. The autumnal southward sun coupled with the natchez crape shedding its leaves is allowing much needed rays for blooming. 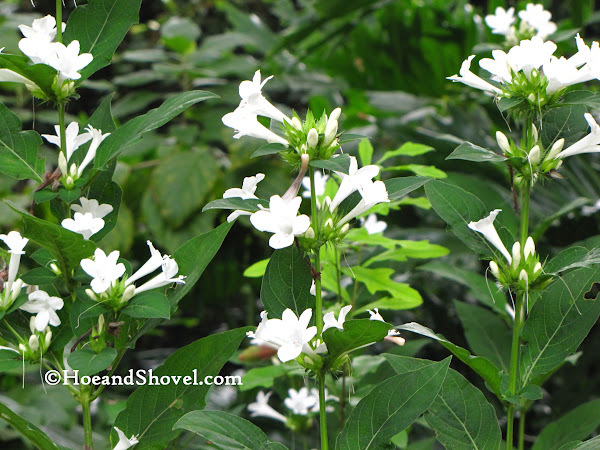 This is the season for the white philippine violets to show off their pristine blooms. 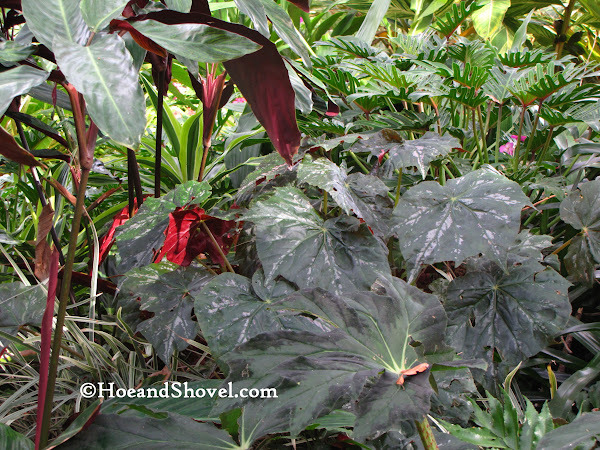 It is a perennial self-seeder that pops up in lots of places around the tropical pathway. It is this time of year when the garden is particularly lush... even the pathway leading to the compost piles is worthy of a photo. 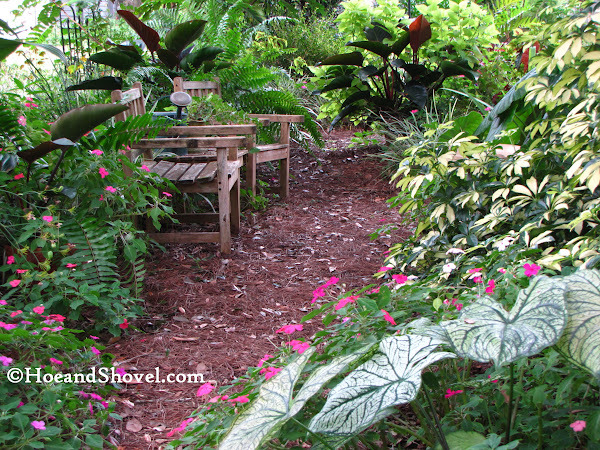 I find this peaceful and shadiest part of the garden a most restful spot. The stillness and quiet is alive with the abundance of nature. It is calming to my soul and confirming that gardening is the most productive therapy. 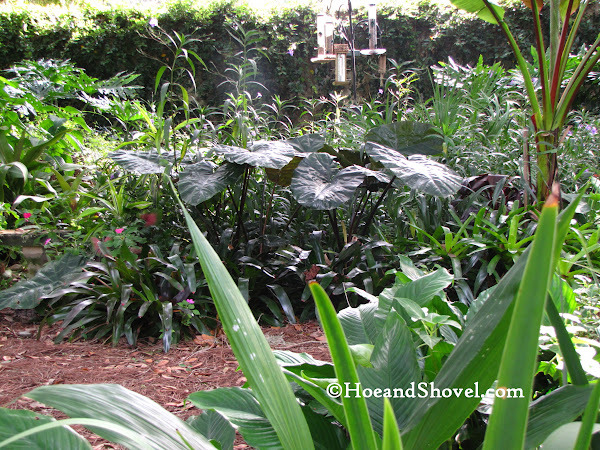 Because of the positioning of the birdfeeders throughout the garden the tropical pathway is also the corridor the birds use to fly low between the feeders and birdbaths. They are free entertainment! Visit Lowe's Garden Grow Along here to read my latest article regarding the birds that visit Hoe and Shovel. Dear Meems ~ Your peaceful area really touches me. It is oh so lovely and I can see why it effects you the way it does. I have the purple Philippine violet, have never seen the white. It is wonderful the way this self sows. Happy gardening here in the cooler weather. 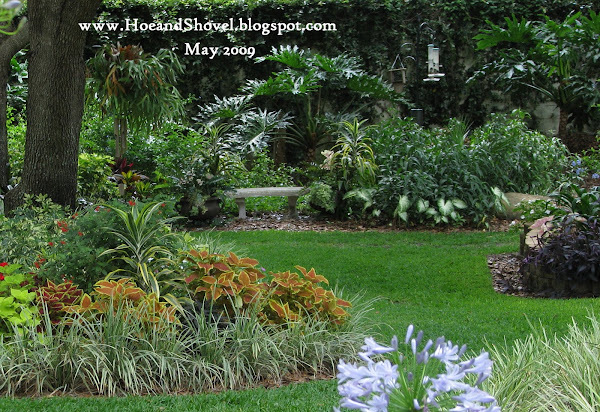 Hi Meems, i am very familiar with the lushness and 'personality' of your garden, in fact in one of my previous posts i wrote that I want my garden to be like yours, in an area as wide as Carol's The Flower Hill Farm. I am really envious of the health in yours, and the diligence you put in them. It really is so energizing and inspiring to stay in a garden as yours. I want to tell you also that I didn't know the one you call Philippine violet is called such. I am familiar with that here. It is somehow unusual if i will call it Philippine violet if i am here in the Philippines, LOL. But I really love your garden, honest! You are oh so right about your garden looking lush right now. WOW. 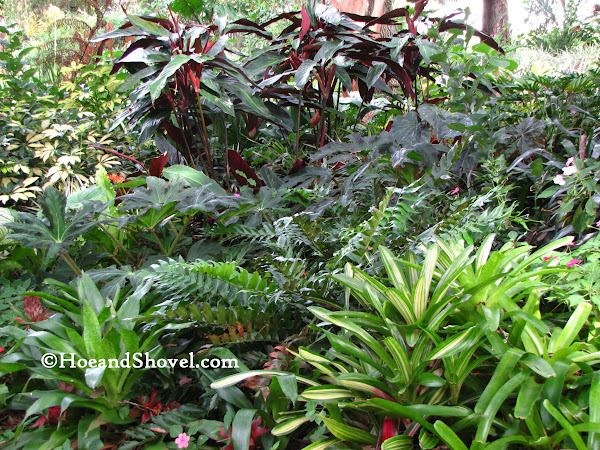 Love the bromeliads all lined up there looking gorgeous. The purple philippine blooms in spring and summer but not the white one. I planted a few of them literally 15 years ago and they are still popping up wherever they please. You are so sweet to say the nicest things about my garden. The Philippine Violet is Barleria Cristata and only blooms in autumn here. You are a little bit far away to join me for a cup of tea... my dream is to visit your country someday! A lot of our plants will work for you in your climate. A tropical path? No, a tropical paradise! Meems, As always your garden looks great, one of these days I will get by and get some cuttings of your Philippine Violets. The garden definitely serves as regenerative therapy for me, and there's no other place I'd rather be. Surrounded by the beauty of nature...what more could a girl ask for! If you think your readers would like it too, please feel free to use it on the Hoe and Shovel blog. There's code at the bottom of our post that makes it super easy to post on your blog. It's all free (of course). If you have any questions about posting it, let me know and I'll try to help. Lovely and serene, as always, Meems. Enjoy the cooler temps! This was a lovely walk. Thank you. I can understand why it is a recharging station for you. I love looking at your photographs of the butterflies that visit your gardens. 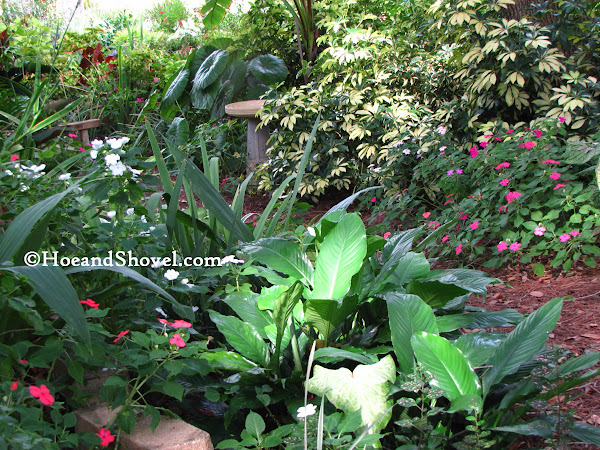 You have created a beautiful spot along the tropical pathway. It is hard to believe it is only 2 short years from the "before" to the "now" pictures. All the leaf shapes and shades of color blend so well. 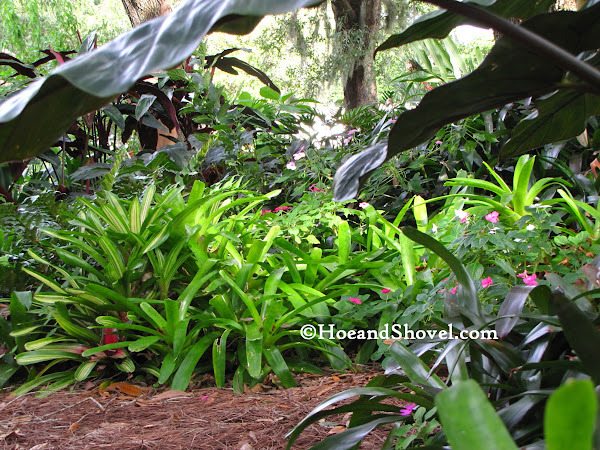 Your garden just looks more and more amazing everyday... And those bromeliads! Wow.